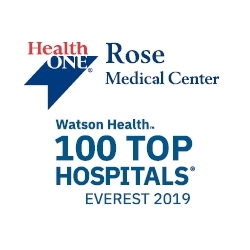 Rose Medical Center has been selected one of the nation's 100 Top Hospitals by IBM Watson Health™ for the 12th time, spotlighting the top-performing hospitals in the U.S. based on a balanced scorecard of publicly available clinical, operational and patient satisfaction metrics and data. Denver, CO, April 05, 2019 --(PR.com)-- Rose Medical Center has been selected one of the nation's 100 Top Hospitals by IBM Watson Health™. The study spotlights the top-performing hospitals in the U.S. based on a balanced scorecard of publicly available clinical, operational and patient satisfaction metrics and data. This is the twelfth year that Rose Medical Center has been recognized with this honor. Rose also is among an elite group of Everest Award winners within the top hospital honorees. Nationally, only 15 hospitals received the Everest Award honor, which recognizes those who rank among the top for rate of improvement during a five-year period. "Our team of physicians, nurses, technicians and support staff work diligently day in and day out to maintain the level of excellence patients have come to expect from Rose," said Ryan Tobin, president and chief executive officer. "The Rose team is continually working together to find ways to improve practices and the patient experience. It is a privilege to be recognized by IBM Watson Health for not only the quality of care at Rose, but also our efforts to continually improve." The Watson Health 100 Top Hospitals® study uses independent and objective research to analyze hospital and health system performance in 10 clinical and operational areas addressing: risk-adjusted inpatient mortality index, risk-adjusted complications index, mean healthcare-associated infection index, mean 30-day risk-adjusted mortality rate, mean 30-day risk-adjusted readmission rate, severity-adjusted length of stay, mean emergency department throughput, case mix- and wage-adjusted inpatient expense per discharge, adjusted operating profit margin and the HCAHPS score (the patient's rating of overall hospital performance). The study has been conducted annually since 1993. - More than 103,000 additional lives could be saved. - More than 38,000 additional patients could be complication-free. - More than $8.2 billion in inpatient costs could be saved. - Approximately 155,000 fewer discharged patients would be readmitted within 30 days. "At a time when research shows that the U.S. spends nearly twice as much on healthcare as other high-income countries, yet still has poorer population health outcomes, the 100 Top Hospitals are bucking the trend by delivering consistently better care at a lower cost," said Ekta Punwani, 100 Top Hospitals® program leader at IBM Watson Health. "The hospitals on this list represent the current vanguard in value-based care and we applaud their commitment to quality." The winning hospitals were announced in the March 2019 edition of Modern Healthcare magazine. Watson Health is a business unit of IBM that is dedicated to the development and implementation of cognitive and data-driven technologies to advance health. Watson Health technologies are tackling a wide range of the world's biggest health care challenges, including cancer, diabetes, drug discovery and more. Well known as a Denver institution and a 9th Avenue landmark since its founding in 1949, Rose Medical Center has earned its reputation as Denver's "Baby Hospital" while becoming a leader in comprehensive women's care, orthopedics and total joint replacement, heart and vascular care, weight-loss treatment, cancer care, surgical services, internal medicine and emergency care. Rose Medical Center is proud to be a part of the HealthONE system of hospitals that earned the ranking as the #7 corporate philanthropist in the metro area and was the only hospital system ranked in the top 10. HealthONE contributed more than $1.5 million in 2018 and supports more than 150 organizations through cash and in-kind donations. With origins in Jewish teachings, traditions and community, Rose’s founders built this hospital to “serve the need of every creed.” By offering a high level of expertise and service across all disciplines, Rose is a destination hospital, attracting patients from throughout Colorado and around the world. Learn more at RoseMed.com, FB: @RoseMedicalCenter, Twitter: @RoseMedical and LinkedIn: Rose Medical Center.